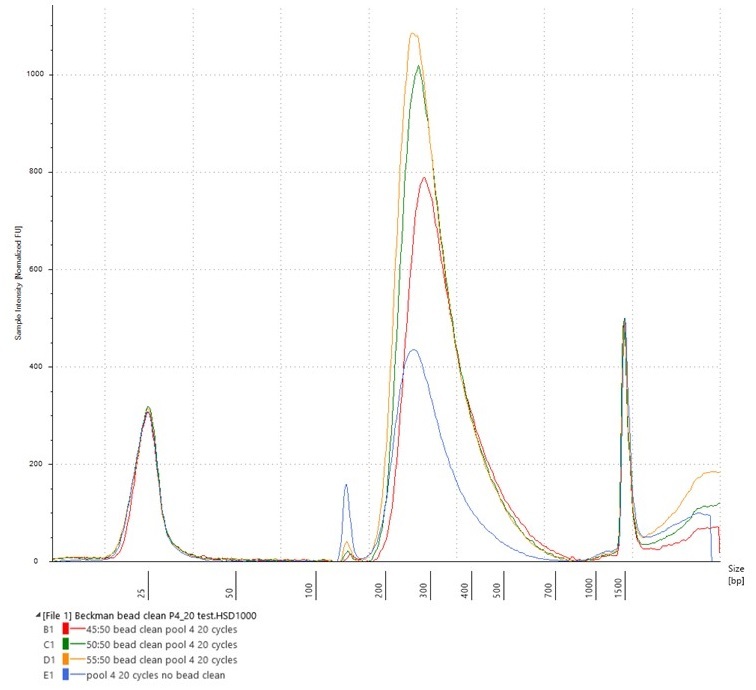 After testing bead-to-sample ratios of 30:50, 35:50, 40:50, 50:50 and 60:50 on a Thermo Scientific™ GeneRuler™ 50 bp DNA Ladder, using Beckman Coulter AMPure XP beads, we focused on the 50:50 (or 1:1) ratio, deciding to test it on a real pool of hybrid-captured libraries that we were not intending to use for sequencing (having rather overdone the post-capture amplification). There was enough DNA in the pool to split it into three 50 µl aliquots, allowing us to try 40:50, 50:50 and 55:50 bead-to-sample ratios. We ran the cleaned samples on an Agilent High Sensitivity D1000 ScreenTape. All three of the bead-to-sample ratios tested removed most of the adaptor peak. 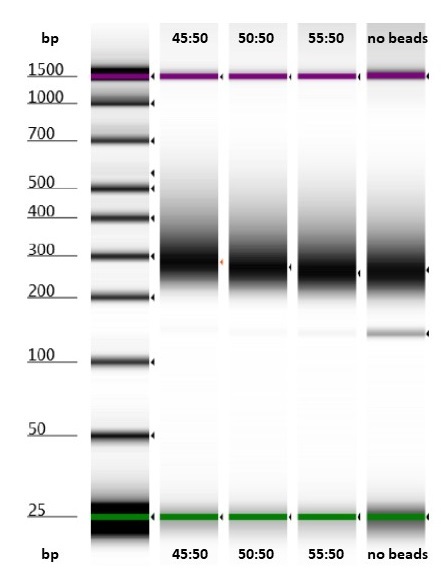 Hybridisation Pool 4, with 20 cycles of post-capture PCR: bead-to-sample test for removing adaptor peaks. The adaptor peak is clearly visible in the “no beads” lane, and faintly visible in the other lanes. 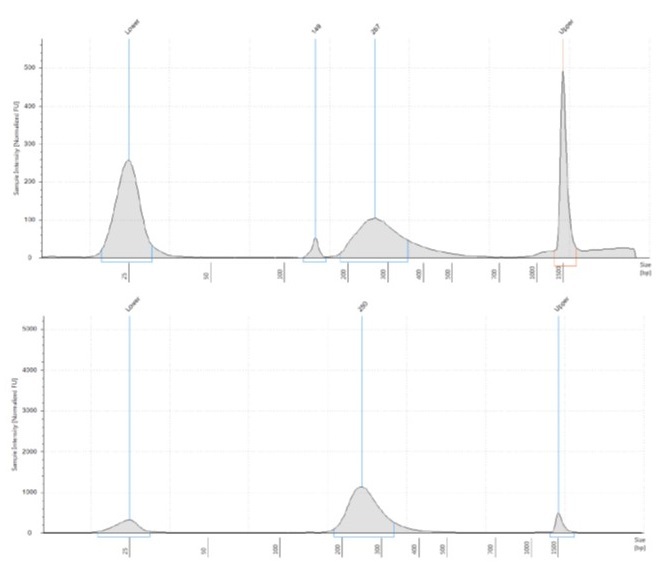 The bead-cleaned library pools (visible as red, green and yellow lines) have far higher peaks (i.e., more concentrated DNA) at the c. 300 bp library size than the original Pool 4 (visible as a blue line), having been eluted into a smaller volume. They all also have far lower adaptor peaks. In the end we used a 1:1 ratio of bead-to-sample to reduce the adaptor peaks in the libraries that we used for sequencing.